To improve my LinkedIn profile-building skills, I’ve just completed Reach Personal Branding’s new Certified Social Branding Analyst program, which focuses squarely on LinkedIn training for executive branding strategists and executive career coaches. Among the first handful of strategist worldwide to be certified in the inaugural offering of the program, I rubbed elbows with elite global brand strategists eager to hone their craft, to keep their career and job search skills sharp. As part of the program, each of us applied what we learned to improve and distinguish our own LinkedIn profiles. I took advantage of the many tips and secrets offered to rebrand, revitalize, and maximize my profile. 1. Having trouble fitting all your relevant accomplishments and value-add contributions in the Experience section for your long-term jobs? You can break down each one into two or three separate job sections, adding different disciplines, functions, or responsibilities to your job title, in the job title field. You’ll get an extra 2,000 characters for each job description you add in the Experience section. More content = better SEO = better visibility for your brand and ROI. 2. Want to easily locate and connect with alumni of the schools you attended? Go to the menu across the top left side of your profile, click on “Connections”, and choose “Find Alumni” from the drop-down. Fill in the name of the school (if it hasn’t already been populated) and any other appropriate fields, and up will pop LinkedIn members who attended that school. Like all social media, LinkedIn constantly changes and updates features to improve the user experience. But be aware that they don’t necessarily let users know about the changes and upgrades, and they don’t always roll out to everyone at once. What works on your profile may not work on someone else’s, until some time later. It’s best to check in regularly at the LinkedIn blog and Help pages for recent changes. Looking for more insider tips to use LinkedIn to your best advantage? 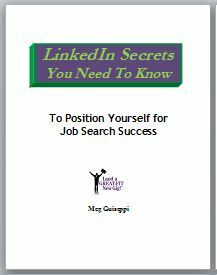 Get my ebook, LinkedIn Secrets You Need To Know To Position Yourself for Job Search Success. Above tips are really very useful. Thank you for your kind comment, Ramesh! I’m glad my post was helpful.